For those of you looking to pick up a copy of either Futuredaze: An Anthology of YA Science Fiction or the newly release Futuredaze 2: Reprise, both books are available at Big Green Books, which is located in the dealers room at Loncon 3. This is it! It’s book day for Futuredaze 2: Reprise! 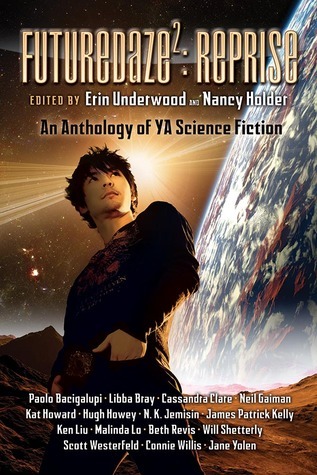 Erin Underwood and Nancy Holder are very excited about this anthology of short science fiction for young adults. Futuredaze 2: Reprise pulls together a stellar selection of reprint stories that range from SF classics to recent YA publications, which features fiction from many of today’s top SF and YA authors. We’ll have copies of Futuredaze: 2 Reprise for sale at Loncon3 this year. However, for those of you who are unable to make it to London this weekend, here are a few links where you can purchase a copy of Futuredaze: 2 Reprise. Erin Underwood will be attending Loncon 3 (the 2014 World Science Fiction Convention) this weekend, handing out glow-in-the-dark Futuredaze 2: Reprise writstbands. So, if you are attending the convention, be sure to say hello.